A permit has yet to be issued by the National Parks Department for the proposed Patriot Prayer rally at San Francisco’s Crissy Field this Saturday, but even if the event is canceled, dozens of counterprotests are expected all over the Bay Area. Congresswoman Jackie Speier believes the reason a permit has not been issued is because officials haven’t determined if the event could pose a threat to the local community. “I’m certain that they’ll make a decision within the next 24 hours that will make it convenient for those who want to protest and those who want to participate,” said Speier after a Women’s Equality Day press conference. Until the National Parks Department determines whether or not to grant a permit, the Human Rights Commission has already begun to schedule a series of community events to help inspire a conversation on the issues of equality. 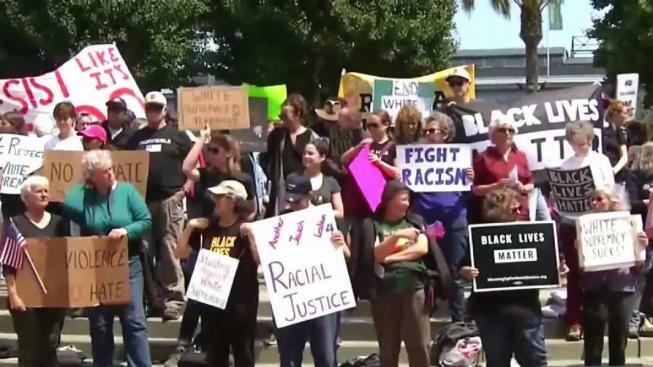 The events focus on educating participants on the historical context of movements against white supremacy in the Bay Area as well as the local impact of racism. “We’re really hoping that folks will stay united, come together in love and avoid putting themselves in a situation where they may be provoked,” said executive director of the Human Rights Commission, Sheryl Evans Davis. Much like the Boston protests last weekend, Democratic leader Nancy Pelosi, hopes that Bay Area counter protesters will behave with the same. Golden Gate Park headquarters have yet to respond to requests for more information on the issue. The Patriots Prayer rally is billed as "a day of freedom, spirituality, unity, peace, and patriotism." Organizer Joey Gibson promises a diverse group of speakers and condemns the recent violence in Charlottesville, Virginia.